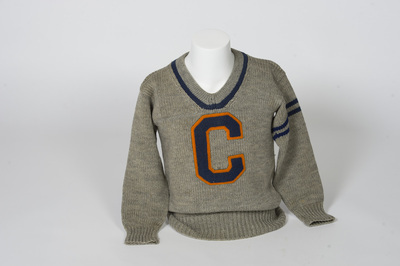 This 1929 varsity football letter sweater was earned by J. Albert Turner of Springfield, Ohio, in his sophomore year. 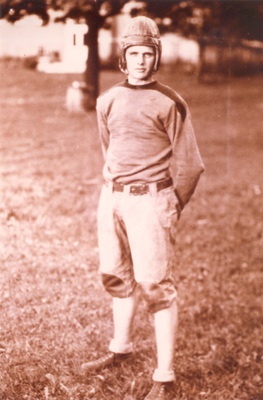 Mr. Turner received 11 varsity letters during his college career. This sweater was donated to Cedarville College on February 20, 1979. The American Mideast Conference, founded in 1949, was an affiliate of the National Association of Intercollegiate Athletics before being disbanded in 2012. The conference established the J. Albert Turner Award in honor of Mr. Turner. The award was presented to the Player of the Year in each of the conference's 15 championship sports. Mr. Turner served for many years as Commissioner of the Mid-Ohio Conference (the name the conference used from 1962 until 1998). He provided leadership and financial assistance to the conference, especially during its formative years, and used his expertise as a longtime football and basketball official in serving as the conference's Supervisor of Officials. He was a respected member of the Springfield, Ohio, community, and served as a junior high school teacher and coach for 30 years. To view and download this image of J. Albert Turner, click here.